Following the re-release of “Policy” in March, and a new album later this year, Martha Davis and the Motels will be playing live at The Coach House on April 6. The Motels recorded six records for Capitol beginning with their self-titled debut in 1979. 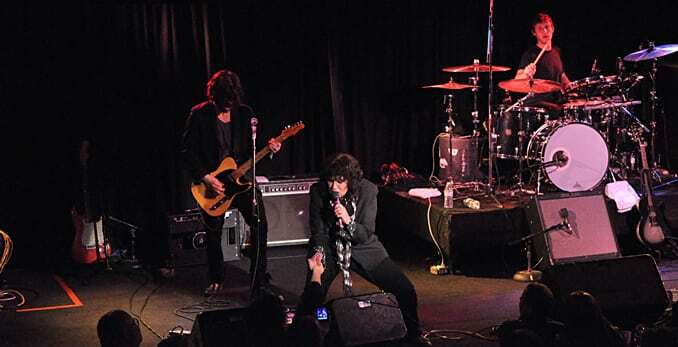 There have been several incarnations of The Motels to support Ms. Davis, although the current line-up has now been together longer than the band that signed with Capitol! There is a lot in the works for 2013 with new recordings, exciting new music videos of both her hits and new tracks, a revitalized touring schedule in the US, a return to Australia and, for the first time in several decades, a return to Europe. OCCG: It sounds like 2013 is going to be an exciting year for The Motels. What are you looking forward to the most and why? MD: I think, (and this is a hard question… seems like a lot of fun projects coming this year) that the making of a new album is what I’m looking forward to the most. The creative process is always the most exhilarating. That said, playing shows is just FUN! I think what I’m looking forward to the most is this year. OCCG: What favorite Motels songs can fans expect to hear at the shows? Will there be any new songs, in the set, as well? OCCG: Who are the current band members and can you tell me a little about their history with you? MD: The guys in my band, first of all are amazingly talented. Eric Gardner, drums, was the first to join around 2002 or 2003, I saw him playing at the Baked Potato with Wayne Kramer. Clint Walsh came next, and started a bizarre pattern in Motel hiring. Clint joined as a bass player, but then one day in rehearsal he picks up a guitar and OMG! I’m like “you’re a guitar player! And an amazing one at that!” So Clint moved to guitar. Nick Johns, awesome bass player, son of a soul singer, and all around great musician, joined the band at the ripe old age of 23? Maybe 24. Then I hear him play keyboards. “Ah, we really need a keyboard player, and you’re really good.” Nick moves to keys. So then we hire Jon Siebels, great bass player, and multi talented. Jon was very much a part of the band on the THIS album. Jon was also a member of Eve 6, and left The Motels when they reformed. Then it happened… we hired Brady Wills. Aside from being one of my favorite bass players, he’s Brady. You really have to come to the show to experience the Brady, multi talented in many aspects of art, from modeling to comedy or both. Now because, these guys have been busy, over the years, I’ve had to find subs, and the subs are now as much a part of the band as anyone… starting with Tig Moore. Tig, came to me a few years ago, and is a godsend. A great drummer, as well as being a sound man and tour manager, Tig always is so rock solid and sweet, and damn if he can’t fix any problems with the sound systems, even if the clubs can’t… did I mention I was a lucky girl? The other ‘go to’ is Adam Zimmon. Adam is an astonishing guitar player, and always a joy to work with. OCCG: I understand you are writing some new material this year. What has been the inspiration and subject matter of your writing?